Our latest senior foster pup, Bear is adorable. I mean, who doesn't love that cute little face! And the furry paws! I adore him. Sometimes he needs a little help calming down. 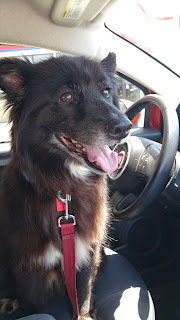 I'm not usually one for the fancy, frou frou world of essential oils, but they have really helped our other senior foster encounter new situations like getting petted, going to Petco, and meeting other dogs. So following in the line of my most popular pattern in Norway (hello Norwegians!) I analyzed a common household shape (a tube) and made it apply to a collar accessory that my other dog already owns, a Sniff-It. This FREE pattern uses a bit of needle felting as well as crochet, so kids, be careful around those felting needles!